The Great Compassion Mantra is a miraculous chant given to the world by Kuan Yin, the Regarder of the Cries of the World. This Mantra has many miraculous attributes. The Dharani Sutra teaches that humans who recite and hold the phrases of the this powerful and lovely Mantra will be spared the fifteen bad kinds of death; that they will be born in the Paradise of the Daughter and that human births after this Paradise will be auspicious ones conducive to progress toward final Enlightenment. They will obtain everything they seek. "Those who recite and hold the Great Compassion Mantra will obtain the fifteen kinds of good birth. All gods and people should constantly recite and hold it, without carelessness." The Great Compassion Mantra is, in fact, rather complex for a Western person to recite and, Chinese being a sacred language, the value of translations is doubtful. For our own practice we may be better advised to use a simpler mantra such as Om Mani Padme Hum. However, since hearing the Great Compassion Mantra in itself confers blessings, we are presenting this video of the Great Compassion Mantra sung by Ani Choying Drolma in Tibetan. For those who wish to hear this wonderful mantra, perhaps putting it on an iPod or other portable music player in order to hear the Great Compassion Mantra as they travel or go about their worldly business, we include a different version of the Mantra in MP3 format which you may right click (ctrl-click for Macintosh) to load down. If you have any problems, please contact us and we shall be glad to help. Here is another version of the Great Compassion Mantra in MP3 format. Click to hear it, or right-click (ctrl-click for Macintosh) to load it down for personal use. We include for your interest a traditional ritual using the Great Compassion Mantra at your home shrine. Please do not worry if this is a little complex for you. 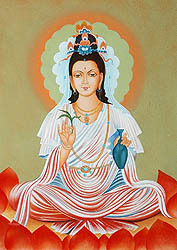 Simply chanting Om Mani Padme Hum is a perfect devotion to Our Lady Kuan Yin. 6. Invite all the Buddhas and Bodhisattvas to come and be present. An Sho Li Sho Lie, Mo Ho Sho Li, Sho Sho Li, Sa Po Ho (So Ha). 9. Recite the Kwan Yin Great Compassion Mantra 3, 5, 7, 21, 49 or 108 times. Na Mo Kwan Yin Boddhisattva. 11. Finally, drink the water blessed by Kwan Yin. This water now has healing powers. 12. Dedicate this practice of the Kwan Yin Great compassion Mantra to the benefit and enlightenment of all beings. May the Mother of Boundless Compassion and the Daughter-Saviour bless you always.